How much does it cost to travel to Giverny? How much money will you need in Giverny? €100 ($113) is the average daily price for traveling in Giverny. The average price of food for one day is €28 ($31). The average price of a hotel for a couple is €96 ($107). Additional pricing is in the table below. These average travel prices have been collected from other travelers to help you plan your own travel budget. Giverny (pronounced jee-vair-knee) is a commune in Northern France. It sits on the right bank of the River Seine where it meets the River Epte. This area has been a settlement since Neolithic times and the town has various monuments from many periods of its long existence. Beginning around 1887, a number of American Impressionist artists settled to work in Giverny, drawn by the landscapes, the overall atmosphere, and the presence of Monet. It has now become a place of pilgrimage for many art lovers. It was here that Claude Monet lived for 43 years, until his death at the age of 86 in 1926. Although his house is now prized by connoisseurs of 19th-century interior decoration, it's his garden, with its Japanese-inspired water-lily pond and bridge, that remains the high point for many, as it is a 5-acre, three-dimensional Impressionist painting where you can stroll around at leisure. Most make this a day trip, but Giverny has some lovely lodgings, so you could also overnight here. Many of the sight in Giverny are related to the famous artist, Claude Monet. You can visit his tomb and his house, the Claude Monet foundation, and the most popular of them all: Monet's Giverny Gardens. The Gardens are actually two separate gardens: a flower garden called Clos Normand in front of the house and a Japanese inspired water garden on the other side of the road with Japanese style bridges at each end of the beautiful lily pond. Another popular attraction is the Church Sainte-Radegonde de Giverny, the church in Giverny, whose oldest parts date back to the 11th century. Claude Monet and his family attended church here and he is buried in the nearby cemetery. Giverny is a small town, so there aren't really any neighborhoods here. All of the main attractions are located along the same street and aren't too far apart, which makes it pretty easy to see most of the towns attractions within a one day trip. 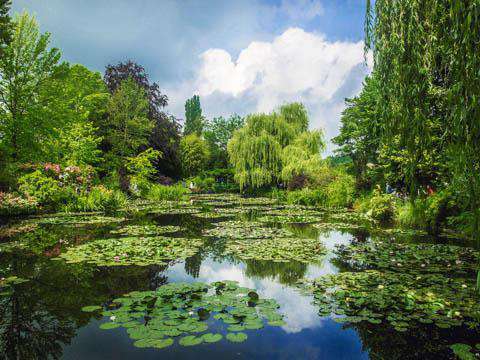 There are many one day trips of Giverny offered from Paris, but if you'd like to be free to go at your own leisure and pace and take in all the art, culture, and beauty of the area, staying for more than a day is also an option. Giverny is considered a rural town and it has a quaint small town charm to it. It is right on the banks of the Seine River, so that is another option for exploring some of the natural beauty in the area. With all of the Monet-related sights, you may not have a lot of time for anything else, but in case you are looking for a little something different while in Giverny, there are plenty of other things to do. There is the Museum of Impressionism and the American Museum of Art to explore. You could also try a boat tour on the River Seine for a beautiful and different look at the Seine valley landscapes. You could also take a trip back in time by going on a country tour in an old Citroen Traction car. If you're looking for more Monet-related activities, try taking the Monet tour, or for something different try a tour of the old mill or castle. Giverny is not as big a name in the culinary world as is some of the other cities in France, but it still does have quite a few good dining options. There are some specialty dishes right out of the Claude Monet Impressionist Cook Book, such as Egg Orsin, Potato Pie, and Strawberry Mousse. A few restaurant ideas include: the Terra Café, which is a popular spot and offers delicious food- the menu varies between French and American cuisines; The Restaurant Baudy, which offers a terrace area and serves great traditional French cuisine; and the restaurant Les Nympheas (the water lilies), which claims to offer the painter's favorite recipe's. The closest airport to Giverny is the Paris airport, being only about 50 miles away. This makes Giverny easily accessible as the airport in Paris is one of the largest international airports in the country. It is easy to get to Giverny from Paris on public transportation. You can take the train out of Paris into Vernon, and from Vernon, it is only another 7 kilometers to Giverny, which you can either walk, hire a taxi, or take the shuttle bus that goes from Vernon to Giverny. Of course if you'd rather do things on your own schedule, renting a car and driving to Giverny is also an option.